BRATISLAVA, Slovakia -- The prime ministers of Slovakia and Ukraine condemned on Thursday a recent deal to expand a pipeline that delivers natural gas directly from Russia to Germany. 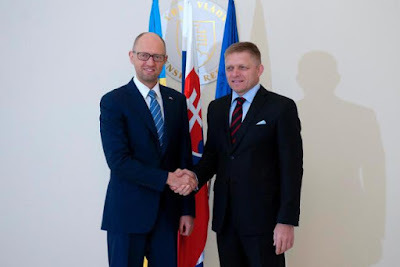 Slovak Prime Minister Robert Fico (R), welcomes Ukrainian Prime Minister Arseniy Yatsenyuk before their meeting in Bratislava, Slovakia, Thursday, Sept. 10, 2015. After their meeting, Ukraine's Arseniy Yatsenyuk called the plan — known as Nord Stream 2 — "an anti-European and anti-Ukrainian project." He warned that the plan will threaten gas supplies for the southeastern EU countries and will lead to a higher price of gas. His Slovak counterpart, Robert Fico, said the project contradicted the European Union's discussion on how to help Ukraine and that his country feels betrayed. "They're simply making fools of us," Fico charged at a news conference. He said he will address the issue at the EU Council. An agreement signed earlier in September between Russian giant Gazprom and energy companies from Western EU countries, including E.ON, OMV, Royal Dutch Shell and others, is meant to expand the current Nord Stream pipeline under the Baltic Sea that directly links Germany with Siberia's natural gas reserves. The deliveries are expected to begin in 2019. As the pipeline bypasses both Ukraine and Slovakia, the traditional transit countries for Russian gas to Europe, Yatsenyuk said his country would lose $2 billion and Slovakia $800 million in transit fees. The project was also criticized by Poland. A year ago, Slovakia began to send natural gas to Ukraine from Western Europe by reverse-flow — that is, transporting the gas in the opposite direction to its normal flow — as Ukraine was facing a threat from Russia to cut off supplies because of a massive debt. 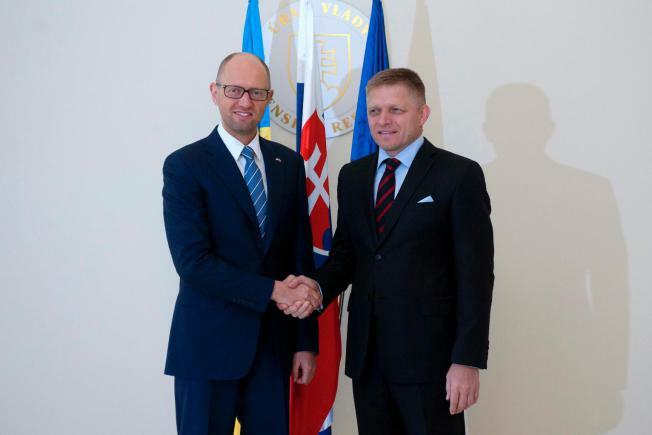 "If (the Slovaks) hadn't done that, Ukraine would not have survived the winter," Yatsenyuk said.